House passes National Medical Education Bill with majority amidst protest - Integration Through Media ....! KATHMANDU: The ‘National Medical Education Bill- 2075’ has been finally passed by the House of Representatives (HoR) with majority. Minister for Education, Science and Technology Giriraj Mani Pokharel presented the document, seeking the House approval to pass it, amidst protest of the main opposition Nepali Congress. She demanded a government clarification on how it will deal with the operation of two hospitals–GP Koirala National Centre for Respiratory Diseases, Tanahun and the Sushil Koirala Prakhar Cancer Hospital, Banke. “We are concerned about the devaluation of the Nepali Congress and its leaders,” she said. There is a need to acknowledge that the government can operate with the support of two-thirds majority, but not the House, she said. 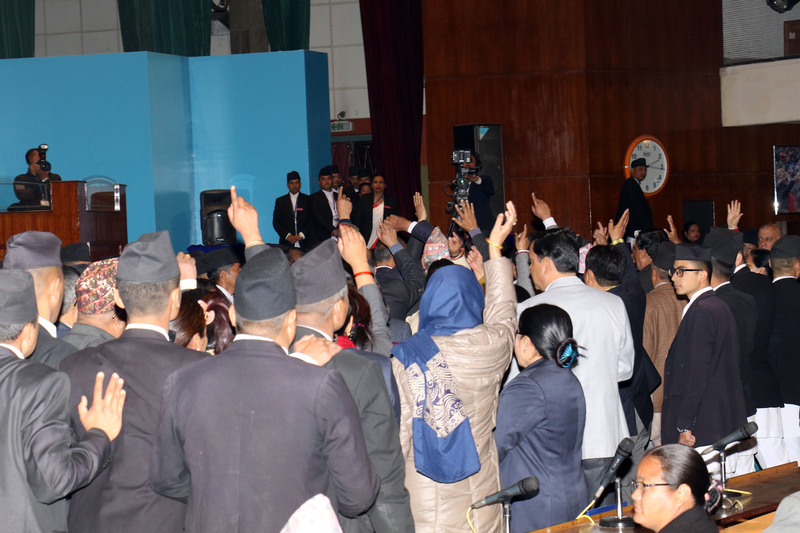 Shortly after her statement, main opposition NC stood up in protest and encircled the rostrum. Speaker Mahara repeatedly asked the protesting party to let House business run. “Do not protest, take your respective seats, and assist with House business, as there has already been a ruling to the government to respond to the issues raised by opposition parties,” the Speaker implored the protesting opposition party lawmakers. The House will next meet at 1 pm on January 31.